Our Chapters from the Western Front battlefield tour, traditionally ends with a look at life behind the lines during World War 1 with a visit to Talbot House. By 1915, Britain had a million troops on the Western Front, 250,000 of whom were based around the Belgian town of Ypres. The town of Poperinge was some seven miles behind the lines and inevitably became a major attraction to soldiers with a few francs in their pockets and some time on their hands. Known as “Little Paris” or just “Pops”, the town became a major centre of rest and recreation to servicemen during World War 1. It offered attractions such as bars, brothels, cafes and cinemas to soldiers anxious to forget the war for a brief period. Many soldiers, however, sought recreation which was rather more wholesome and also which avoided the exploitation which often occurred. Soldiers were frequently charged high prices for cheap, adulterated and poor quality goods. Two army chaplains, Neville Talbot and Phillip Clayton, shared these concerns and decided to offer an alternative. Having acquired a large merchant’s house, they established an “Every-Man’s” club, where without distinction of rank, servicemen could find rest, peace and entertainment. Eventually named Talbot House, in memory of Neville Talbot’s brother, Gilbert, killed in the summer of 1915 at Hooge, the house opened its doors at the end of that year. Talbot House offered soldiers and airmen a library, a chapel, a music room, quiet rooms to sit and write a letter or just enjoy the tranquillity. Sitting amongst the flowers and lawns of the garden must have truly felt like a corner of paradise to soldiers returning from the trenches and the Ypres battlefields. A Friends’ Corner allowed men to place enquiries about the wellbeing of a friend or brother or simply to record their own name to let others know that they were still alive. Eventually, the adjacent hop warehouse was also acquired and became a concert hall. The house was run by Philip “Tubby” Clayton until the end of the war, making him a legend of World War 1. Clayton created the chapel in the attic of the house, but always stated that the house was upside down as the chapel represented its foundations. Much of the furniture in the house was donated and two soldiers protested when Clayton asked them to carry an old carpenter’s work bench up the steep stairs to the chapel to act as altar. In response to their argument that an old carpenter’s bench was unsuitable for an altar, Clayton stated that he could not think of anything more suitable! Though clearly a popular man of considerable compassion, Clayton ran the house on firm lines. Visiting the restored house today is a wonderful experience and the evidence of his presence is still very clear. The notice above his office states, “The boss is not always right, but the boss is always the boss”. Another states, “If you are in the habit of spitting on the carpet at home Please spit here.” A notice in the library states, “This is a library, not a dormitory” and another points to the door, “Pessimists, way Out”. 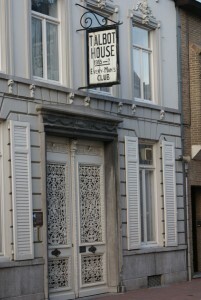 After 1918, the traditions of the house were continued in the Toch H movement, which became a world-wide Christian movement. The original family moved back into the house in Poperinge following the war, but it was purchased for Toch H in 1930. Though initially reluctant to sell, the family could no longer cope with the sheer numbers of ex soldiers knocking on the door of the house which had provided them with a refuge from the horrors of war. 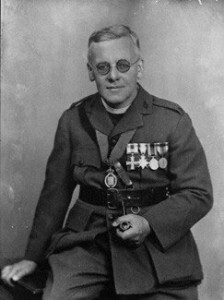 After the World War 1, Philip Clayton became the vicar of All Hallows by the Tower in Tower Hamlets, a position he held for forty years, in addition to his continuing work for Toch H and a number of charitable causes. He was also chaplain to the BP company and to the tanker fleet during World War 2. He died in 1972 and is commemorated by a memorial in All Hallows by the Tower.